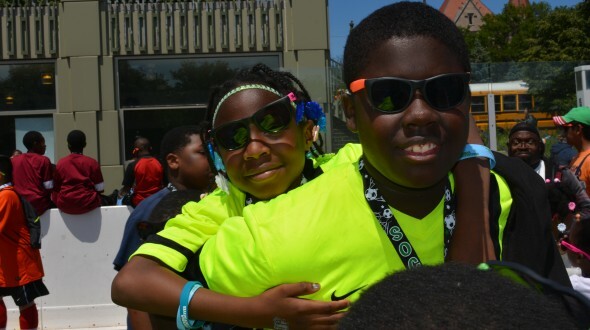 Last Saturday, the day Urban Initiatives kids across Chicago had been working toward all school year finally arrived. 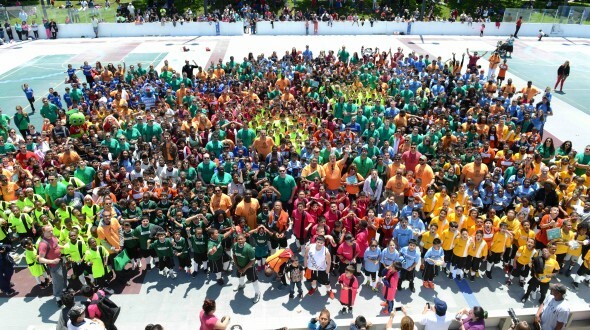 The 3rd Annual Work to Play Cup started with a sea of yellow school buses pulling up to the Midway Plaisance in Hyde Park as more than 200 volunteers, Board and Junior Board members, and Urban Initiatives staff put the final touches on an event to celebrate every Work to Play soccer player. 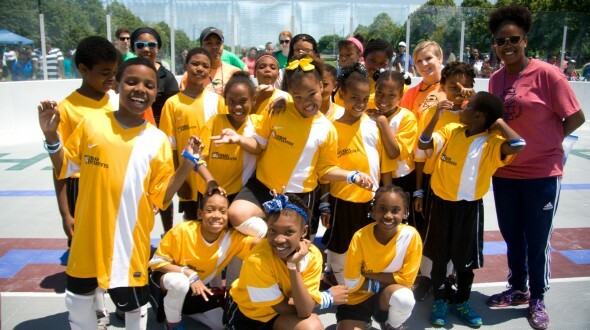 With more than 1,000 Urban Initiatives soccer players, plus families, coaches, community leaders, principals, teachers, and supporters from across the Chicagoland area participating, this year’s Work to Play Cup was by far the biggest and best one yet. 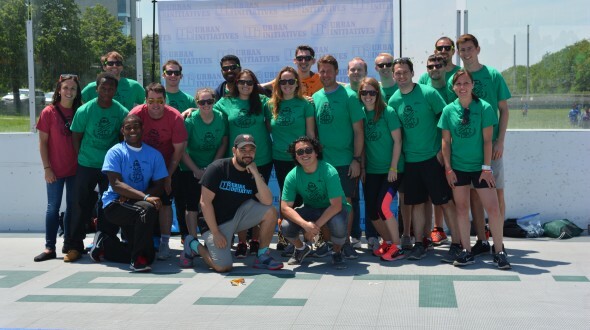 Work to Play teams and their volunteer coaches rotated through a series of four stations during the morning. 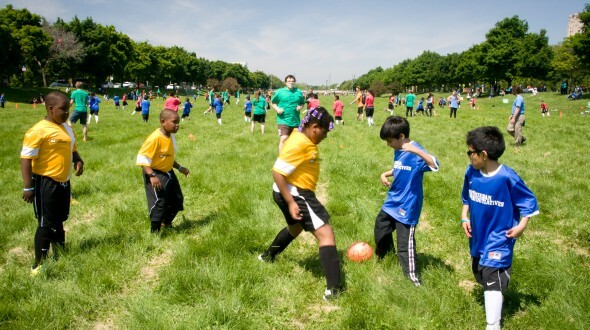 Each team had the opportunity to play in friendly soccer matches against children from other Urban Initiatives schools. The passing and shooting were crisp, as each player sought to show off all he or she had learned over the course of the year. 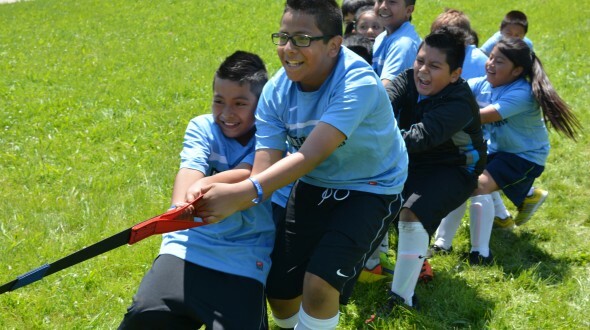 After soccer, participants moved onto Play with Potential recess stations, where our REC Coordinators led kids and volunteers in a series of fun recess games like tug-of-war, Clown Car Relay, and Escape the Omnikin (AKA that scene with the boulder in Temple of Doom)! After working up an appetite on the field, teams headed to lunch, where for the second consecutive year, Aramark provided each player, coach, volunteer, and parent with a healthy and delicious boxed lunch. Lunches consisted of a sandwich, apple juice, and a fresh piece of fruit. All that nutrition was plenty to help fuel everyone at the Work to Play Cup. Our players weren’t the only ones having fun. Family Fun Zones gave parents and siblings a chance to join in on the action as well. Sidewalk chalk, sack races, and face painting got everyone involved! For our 5th-8th grade players, the Take the Lead Team Captains Station Presented by Grainger saw over 100 Team Captains come out ready to play soccer and celebrate a successful year of leading their teams. As midday came, the tournament portion of the Work to Play Cup came to an end. This wasn’t an end to the action, though. The party was just about to start. As each school made their way onto the ice rink, Coach Cris, atop his perch on the Midway Plaisance Fieldhouse, got the crowd revved up. Urban Initiatives’ Executive Director and co-founder Jim Dower took over and presented the first half of the awards for the day. 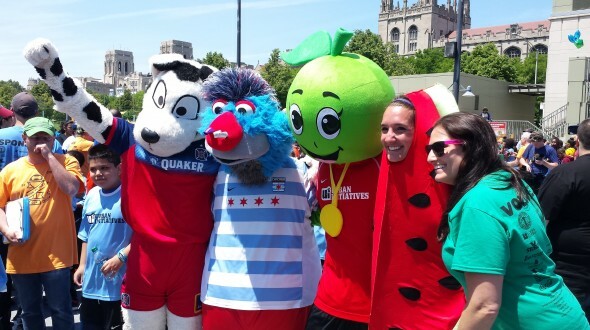 City of Chicago Treasurer Kurt Summers was awarded the Community Impact Award for his dedication to improving each community represented at the Work to Play Cup. This year’s Most Valuable Partner Award went to IMC Financial Markets for their commitment to Urban Initiatives and our programming. Honorary Chairs Brian McBride and Joakim Noah and his Noah’s Arc Foundation were presented with awards as a thank you for being such amazing Urban Initiatives supporters. Coach Cris returned to the mic and began calling out awards for all 35 Work to Play Schools. Each school received a specific award that highlighted a specific characteristic their team members had demonstrated throughout the year. Highlights included the “Teamwork” and “Heart” Awards, the “Hustle and Muscle” Award, and everyone’s favorite, “The Chicago Style” Award, which was presented to Howe School and Lawndale Academy. Once all of the awards were given out, Urban Initiatives resident DJ, Freddy Phatz dropped the beat and an amazing dance party took over the ice rink. Players, parents, and coaches smiled and laughed across the ice rink, and mini dance battles broke out every time a new song started. The Work to Play Cup would not be possible without our incredible sponsors. Urban Initiatives would like to thank the following sponsors for supporting the Work to Play Cup this spring: Attorneys’ Title Guaranty Fund, Bear Construction, Bernstein, Chris Campbell, Chubb Insurance, Citadel, Design Organization ,Douthit Family, Dayle Duchossois & Edward Fortino, Erie Insurance, Feldman Family, Fortier Family, Friedman Properties, Girgenti Family, Glew Family, Grainger, Group One Trading, Harper Families, Hearn Family, Hirshman Family, JP Morgan Chase, Kirkland & Ellis, KPMG, LGC Class of 2015, Loeb & Loeb, Ann & Robert H. Lurie Children’s Hospital of Chicago, Dave and Rachel Mahoney, McGranahan Family, Performance Trust, Princetonians of Chicago, Sue Rancourt and Andrew Campbell, Raymond James, Redd Family, Reichert Family, Ricketts Family, Rodman Family, Sidley Austin, Skender Foundation, Sterling Bay, Storck USA, Chicago Park District, Student Board, Jonathan Taylor, and Woodman Cison & Associates.